The cooking technique is unusual: broiling the onions, skins on. The ingredients are unusual: onion, raisins and capers. 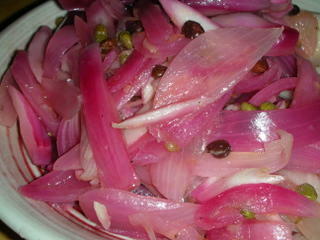 So MUCH onion is unusual: to my mind, it's more relish than salad. And I do think that it will be good, once the onions are more fully cooked. As is, it is just too much onion. (And imagine one's breath!) But there is also something quite wonderful about the sweet currants and the salty capers against the rich onion. While the onions cook, mix the remaining ingredients in a large bowl. Let the onions cool until cool enough to handle, about 20 minutes. Remove the tips and the skins. Cut in half vertically, then slice thin along the vertical line. Stir into the olive oil mixture. Let onions marinate at room temperature for at least an hour and up to 24 hours. Serving suggestion: Line a serving dish with salad greens, spoon onions over. Good with grilled meat and roast turkey.